Clark composes an email to his mother. He tells her about everything that has been happening to him. Soaring above the plains with the animals, wrestling with animals, he loves all of it. He also tells her about how he has begun to see auras around living things. He has also begun to work the strange book that was found in the spaceship. He cannot understand any of it, but he can tell one thing. The symbol is important. Throughout millennia it was used on his planet. He then moves on to Kobe Asuru and his new friendship with the man. Clark feels that the way Kobe uses his life, Clark is putting his own abilities to waste. He does admit that he knows he has to keep it secret, and every time people have learned of his powers then they have ostracized him afterwards. Clark just wishes he could find a way to use his powers without having to feel isolated. He gives love to his father and signs off. Clark meets with a political official to discuss the dispute happening in the country. He tells Clark that they won't concede anything to them. They don't need recognition for anything. Turning to answer a phone call, he dismisses Clark. Returning to Kobe, he tells the people not to march. They should send a few people, but the government is just hoping for a chance to fight. Kobe asks Clark if one man, without a following, can be convincing enough. Clark tells him that Kobe can be, and he called in some favors too. Kobe speaks to the masses, surrounded by many citizens and dozens of reporters that Clark called in to carry his message. As Clark watches, he is suddenly interrupted by Kobe's sister, Abena. Their village is being attacked. Clark turns away from the gathering instantly and begins to pull Abena with him. Telling Abena to stay away from Kobe, and asking for his father's forgiveness, Clark leaps skyward. Behind them in the crowd, a man gives the order to silence Kobe. As he speaks, Kobe is suddenly surrounded by men and put under arrest. Back in the village, Clark streaks in to intercept a missile. Burning, he heads towards the attackers and tells them to leave. Grabbing their Jeep, he hoists it up and smashes it into a cliff face. From her hiding place, Abena looks on in shock. As Kobe is surrounded by supporters and attackers, one man pulls a knife out of his shirt. Back in the village, Clark hears shouting and immediately grabs Abena and returns to the assembly. Eyes glowing, Clark identifies the attacker and says he cannot run from him. As all of the cameras in the area shatter, he streaks down and through a car, grabbing Kobe's assassin. Slamming him up against a wall, Clark demands to know who was at fault. Terrified, the killer points at the government representative with an accusing finger. In seconds, the rep is surrounded by reporters badgering him for information. Turning to Kobe, Clark tells his friend to hold on, but tears fill his eyes as he watches the man's aura slowly wane, and then vanish altogether. The next day's paper bears the story of Kobe's assassination, with a byline of Clark Kent. Standing by Kobe's grave, Clark tells Abena he knows she feel strange around him. All she can ask is why he couldn't save Kobe. He tells her that he was saving Kobe's people instead, and that is what the man would have wanted. He was a great man, and the world will be a better place because of him. In Smallville, Jonathan Kent complains about the bags of seed he has to unload when he suddenly turns around to find his truck empty with Clark sitting on top of a pile of bags. Father and son walk together towards the house. Pa tells Clark that his mother is in her hobby room, searching the internet for information on UFOs. Coming inside, Clark hugs his mother and asks what is new around town. His parents tell him that he doesn't need to be cryptic, but no one has heard from Lana for years. Then Clark asks about Lex, and all Martha will say is that he has started a business in Metropolis and that's all she wants to hear of his name. His father comments on the trouble Clark would be in if the world ever found out about him, and Clark tells his parents to follow him out to the barn. Hoisting the spaceship above his head, Clark removes the blankets from the interior of the craft. He tells his parents that when he was acting in Africa it felt like he finally had purpose. He isn't going to run from who he can be anymore. Picking up a piece of red cloth, he begins to cut it with his heat vision as he asks his mother if she can still sew. Story - 3: So here is the dilemma. A really good story comes along that you can thoroughly enjoy, but the story completely ignores seventeen years of established continuity. I'm not sure how to take this series, or how to judge it. I enjoyed this issue. It was fun. Seeing Clark soar above plains was great. We never see him enjoy using his powers anymore. The whole issue was well written. Mark Waid said, this past weekend in Chicago that he is putting his heart into this project, and I can tell. It just reads well. There were a few problems with it. Why is email and the internet in existence? Sorry, but Clark isn't that young. Secondly, and most important, why are all of these people learning his identity? We see at least a dozen people learn of his powers in this issue. So when Superman shows up soon after this, don't you think they would put two and two together? This was just sloppy. Overall though, ignoring these facts, this is a solid issue worthy of a four. Then I have to consider continuity. And yes, I know that the argument "if you enjoy it then it shouldn't matter" can cover this, and that does have some merit. If you like this version, then believe this is the true story. It is only fiction after all. However, and this is a big however, how are we supposed to have a cohesive story if this kind of thing goes on. Think about the things that have been written out of history by this issue. We no longer have Krypton's history. That voids the Eradicator, and by a stretch, Doomsday as well. So now we have no Death of Superman. Even if you did have Doomsday, without the Eradicator you would have no resurrection so Superman would still be dead. Not to mention the fact that the Cyborg couldn't exist without the birthing Matrix. I know I'm being picky, but this really bugs me. So continuing off on this topic, if they still have the craft, and there isn't a chunk of Kryptonite on it, then Metallo can't come into being either. This issue also wrote out the fantastic "Biography of Lex Luthor", as now Lex is from Smallville. So much for him killing his parents for $300,000. There also isn't a space plane anymore. No rescue by Clark, and no flight back to Smallville to meet his parents. We no longer have Clark talking to his father, telling him "They all wanted a piece of me". My biggest gripe of all though, is the costume in the ship. Why does the symbol have to come from Krypton? I liked the idea of Clark and Pa developing it out in the barn while Martha sewed away. That's enough griping out of me. If it isn't broken, don't fix it, and I don't think the Byrne revamp was broken. So recapping, I enjoyed the story, I really did. But every time I have to think about what this does to the past SEVENTEEN YEARS of history I can't stand it. Overall, I'll go with average. It's not really fair for me to blame Mark Waid. He is telling a good story. It's more entertaining than anything in the core books right now, and Clark actually feels like Clark. I just wish we didn't have to sacrifice everything we know about the character to achieve that. Art - 5: Page two. That's all I have to say. I want to own the original art from this page. For those too lazy to pull out their issues, that is the shot of Clark soaring through the sky with a grin on his face. Secondly, pages 15 and 16. Clark bursting into flames and then crashing the car, which was fantastic of Mark to work that in by the way, was just beautiful. This art isn't something I would normally associate with Superman. I wouldn't want this art on any of the core books. And yet, I am thoroughly enjoying it here. Hats off to Mr. Yu for a great job. Cover Art - 3: I like the logo and I like the coloring of this one a lot. I also like Kobe being in the crosshairs, considering what happens in the issue. I do not like, however, the fact that Clark is changing into Superman. It says "Superman" in big shiny letters, so I really don't think we need to put Superman on the cover to sell the book. I also didn't get the whole "Heart of Darkness" thing. 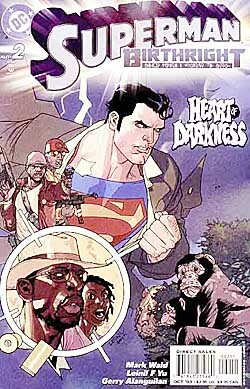 This issue didn't really strike me as a "Heart Of Darkness". Clark wasn't in the deep jungle, and there wasn't really that much horror (As a side note, if you haven't, you should probably read Joseph Conrad's Heart Of Darkness. It's quite a good book). The cover really didn't do much for me.